~The EPC is fully equipped with state of the art equipment. Because we use both empirical and scientific research methodology in our work we do not use gimmicks such as ghost/spirit boxes, random word generators, laser grid lighting, Ovilus devices or any other gadget that creates false positives. Our equipment is scientifically based. We do not play “ghost hunter”. ~ Our director of Parapsychology, Afterlife and Paranormal Studies, Greg Pocha, has taught classes in Paranormal Study, is the Top Expert on the world’s largest and longest established Expert Answer site in the category of Ghosts and Hauntings and is the leading authority on Spectral Profiling. He has spent decades studying and researching the paranormal, parapsychology and related subjects, owning a private library dedicated to his studies approaching 1,000 books, a large collection of peer-written journal and scientific study papers, as well as extensive fieldwork. ~ Our investigative teams are trained and experienced and offer non-judgmental, open-minded help. All are bound by contract not to divulge any information regarding our clients that may identify either them or their property location. Your anonymity is assured. ~ Paranormal investigations of your site or residence are provided without any costs to you. The opportunity to investigate, explore and further the advancement of finding the answers to the possibility of an afterlife is all the payment we need. Without clients, exploration would cease to exist. 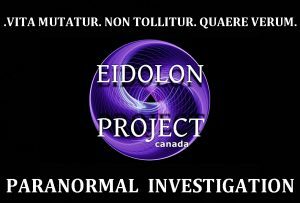 ♦ If you feel that you are in need of assistance or suspect that you are subject to a ghost or a haunting, the Eidolon Project Canada is here to help. From answering questions specific to your situation to full-scale investigations. The EPC offers non-judgmental, unbiased and open-minded assistance. We know that it is often difficult to talk to peers and family when you are faced with a situation that may be paranormal in nature. We’re here to help!